"Senator Paul was having a larger discussion about criminal justice reform and restoration of voting rights, two issues he has been speaking about around the country and pushing for in state and federal legislation. In the course of that discussion, he reiterated a point he has made before that while there may be some instances of voter fraud, it should not be a defining issue of the Republican Party, as it is an issue that is perhaps perceived in a way it is not intended. In terms of the specifics of voter ID laws, Senator Paul believes it's up to each state to decide that type of issue." Just two weeks ago our friends at NewsMax and Watchdog.org's Kenric Ward reported that The Virginia Voters Alliance, and its president Reagan George, told the Virginia State Board of Elections that its research had found 44,000 people who are registered to vote in both Maryland and Virginia. Earlier this month, North Carolina election officials announced they were conducting a massive investigation into voter fraud after discovering that thousands of voters may have cast their ballots in two states during the 2012 presidential election. The officials are also investigating the cases of dozens of "zombie voters" who appeared to have voted in the general election after their deaths. As many as 36,000 possible cases of voter fraud were identified so far in the North Carolina investigation. The large number of “zombie voters” is important in light of our article from a year ago in which we told you about the case of Sister Marguerite Kloos, who entered a guilty plea to avoid indictment for election fraud and the indictment of long-time Ohio Democrat poll worker Melowese Richardson, who was later found guilty of vote fraud. Sister Marguerite Kloos voted in the name of Sister Rose Marie Hewitt, a nun who died before the absentee ballots went out. Kloos, 54, took pains to forge the dead nun’s signature and, as the well-educated Dean of an institution of higher learning, can hardly claim she didn’t know that what she was doing was a crime. Kloos, of Delhi Township, Ohio, faced up to 18 months in prison after being charged with illegal voting and subsequently quit her job as dean of the Division of Arts and Humanities at Cincinnati’s College of Mount St. Joseph's, reported The Cincinnati Enquirer. Long-time poll worker Melowese Richardson, 58, was initially charged with eight counts of illegal voting. In her “fight for Mr. Obama’s right to sit as president of the United States,” Melowese Richardson did not just vote twice, she was charged with six counts of multiple voting in 2012, plus some charges from previous years. Richardson was convicted and sentenced to five years in prison, but served only eight months. So far a post-2012 investigation in Hamilton County, Ohio has turned-up eight individuals who have been charged with illegal voting. The two latest poll workers to be indicted, Timothy Merman of Fairfax, Ohio and Ellen Duncan of Avondale, Ohio, illustrate the problem. According to The Cincinnati Enquirer, Merman is accused of using a closed Fairfax business as his residential address while voting in 2012, said Mary Siegel of the Ohio Voter Integrity Project, a nonprofit focusing on educating people about the election process. Merman also told the jury commissioner that he couldn't serve on juries, Siegel said, because he didn't live in Hamilton County. Duncan was a poll worker at the Urban League of Greater Cincinnati. Siegel's organization believes Duncan voted twice in the 2013 election using an absentee ballot and in person. "She's been a poll worker for over 10 years and she said she didn't understand the rules," Siegel said. Think the problem of vote fraud only exists in Ohio? Think again. A private investigation by The New York Daily News turned up as many 46,000 people who are registered to vote in two states, New York and Florida, a violation of the laws of both states. According to The Daily News, of the 46,000 registered in both states, 68 percent are Democrats, 12 percent are Republicans and 16 percent didn't align themselves with a party. The newspaper found that between 400 and 1,000 registered voters voted twice in at least one election, a federal offense punishable by up to five years in prison and a $10,000 fine according to Reuters’ report of the investigation. But let’s be clear – The New York Daily News only conducted an investigation of New York and Florida. Another especially egregious example of vote fraud in Florida was the case of Wendy W. Rosen, the Democrat’s hand-picked candidate in Maryland’s 1st Congressional District, who was forced to drop out of her race in 2012 after she admitted to illegally voting in both Maryland and Florida. According to reporting by The Tampa Bay Times, election records show Ms. Rosen cast votes in both states during the 2006 general election and the 2008 presidential primaries. In an interview with the Tampa Bay Times Rosen would not discuss where she voted or in which elections, but said, according to The Times, that voter fraud is not a pervasive problem. We’ve regularly told you about James O’Keefe and how his Project Veritas has, in state after state, shown how easy it is to commit vote fraud unless there are strong voter ID laws in place. We’ve also told you how, in state after state, Democratic Party elected and appointed officials from U.S. Attorney General Eric Holder to local precinct election officials have mocked and opposed the need for voter ID laws and other ballot security measures. There was a time when the Republican Party had a ballot security program and put a lot of effort into purging voter lists of dead, moved and inactive voters. Those days are long gone in a Party where establishment political correctness requires pretending that your opponent won’t commit outright fraud in order to win by voting dead people and others who are not eligible to cast a ballot. True the Vote, a national group founded by Texas Tea Party leader Catherine Engelbrecht, and local organizations inspired by Engelbrecht, such as Tampa Vote Fair, which was founded by Kimberly Kelley, James O’Keefe, and his colleagues at Project Veritas, along with Hamilton County, Ohio’s principled Prosecuting Attorney Joseph Deters, have pretty well proven that tough voter ID laws are necessary, especially in swing states like Ohio, Virginia, and Florida. Pandering to the interests of the race-based professional political class will never get Republicans anywhere. Standing for the rule of law, particularly on matters related to voting and citizenship, should be bedrock principles of the Republican Party. In our view Senator Paul is at his strongest when he goes to minority neighborhoods and explains how Republican ideas about economic freedom and less regulation, the conservative social agenda and a more open system of education empower people to chart their own future. We still love Rand Paul, but he missed the boat on his comments about voter ID laws. Now that you've read our original article and the statement released on Senator Paul's behalf please tell us what you think. Submitted by LehmonBaxley on Tue, 05/13/2014 - 18:58. While I agree that voter fraud is a problem, I also have to agree with Senator Paul, that it is not a BIG problem...yet. If left unchecked, it will only get worse, but it is up to the States to determine their own election laws, so no, federal courts have no right to claim the voter ID requirements of various states unconstitutional. I have seen many republicans claim that voter fraud cost Mitt Romney the 2012 election. This is simply not the case. Mitt Romney lost for the same reason John McCain lost in 2008. Conservatives, constitutionalists and libertarians do not vote for "big government globalist corporatists", just because they have an (R) beside their names. It will take a unified party vote to win the White House, and at this point, Rand Paul is the only potential 2016 candidate who is trying to unite the party, much less attract new voters to it. Nominating another "big government global corporatist liberal" such as Christy, Bush or Romney, will only serve to guarantee another loss in 2016. Submitted by purplewings on Mon, 05/12/2014 - 19:01. Submitted by WeimMom on Thu, 05/15/2014 - 15:33. Submitted by WeimMom on Thu, 05/15/2014 - 15:30. Submitted by george.rasley on Mon, 05/12/2014 - 18:02. Submitted by al.78.1931 on Tue, 05/13/2014 - 09:54. We desperately need voting control,but we need very stiff penalties for anyone found guilty of voter fraud. Also the election personel should over seen by two or more at the election poll, ihcluding I/D checkers at the entrances of the voting places. Submitted by Philip Allen on Mon, 05/12/2014 - 15:14. 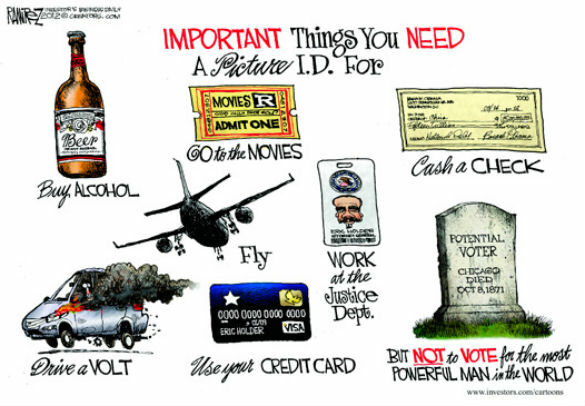 Voter ID Laws are needed pure and simply to stop voter fraud. You need ID to cash checks,etc. There are no reasons why you shouldn't have to produce ID to vote and anyone who says otherwise is peomoting voter fraud. Submitted by rosugill on Tue, 05/13/2014 - 13:42. You are absolutely correct. The voter ID should include a picture and a current address and it should be checked against the registered voter list at the polling station. Anyone trying to vote fraudently should face a severe penalty that could include time in the slamer and absolutely should include a fine of at least $500.